England declared war on August 4th and the instruction to mobilise came out from Downing Street at 4.45 pm. The first reservists were assembled outside The Keep, Dorchester by 5.30 pm the following day and by 7 am the following morning, a total of 175 men had joined up and were kitted out by 9 am. They marched off to Dorchester Railway Station, encouraged by crowds of well-wishers. The Stourhead estate made their cars available to take volunteer recruits to the station. The Queen’s Own Dorset Yeomanry (QODY’s) assembled in Sherborne on August 8th. He reassured families left behind that they would be looked after with separation allowances and maintenance during the breadwinners’ absence, and asked farmers to release men after harvest, and keep their jobs open for them while they were serving in the forces. Calls for recruits continued for the 4th Dorset Battalion Territorials in 1914. In October in Fontmell Magna a special meeting was held with James Ismay of Iwerne Minster in the chair who exhorted more men to join up, in addition to the 23 men who had already left the village after signing up. Several new recruits gave in their names that evening. The National Reserve held a shooting match between teams of twelve men at the Pensbury range (on the Pensbury estate situated on the Shaftesbury to Motcombe road) so they could practise their skills. In December the National Reserve, now numbering about 130 men, was inspected on Park Walk, and complimented on their appearance and drill by General Flint. Under the command of Mr Rupert Williams of Pensbury House, they then marched to Motcombe, accompanied by the Mounted Infantry Reserve, the Boy Scouts and the Town Band. There were regular rifle club competitions in Shaftesbury and the villages before and throughout the war. 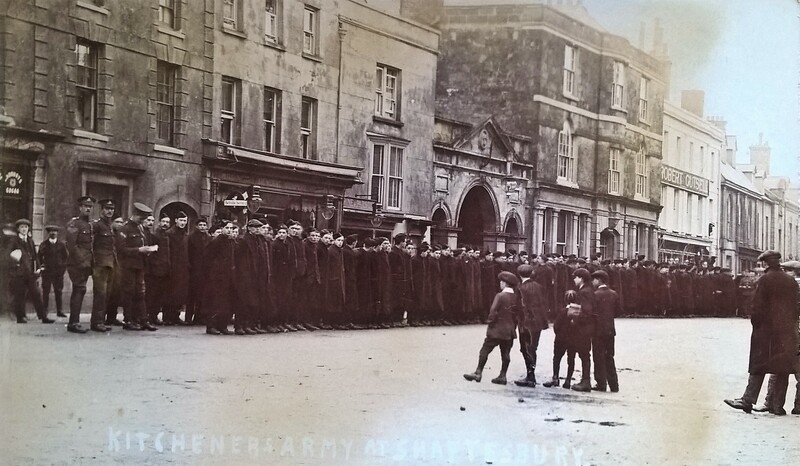 Up to 600 men from various regiments were billeted in Shaftesbury, and were the responsibility of Superintendent Hussey, the senior policeman in the town from 1913. In January men who were stationed in Shaftesbury were inspected and found competent in riding drill, gun drill, marching and physical drill. In October, Sergeant Lemon, who lived in Hartgrove near Shaftesbury, was awarded the Distinguished Service Medal for gallant conduct and devotion to duty at the battle of Neuve Chapelle, France, in March 1915. In the same month King George appealed for more recruits. Every month the sacrifices of those already fighting were described in weekly newspaper articles, often with photos, detailing the names and regiments of those who had recently been killed or wounded. The Stainer family in Cann was commended for its patriotism as their five sons were all serving abroad, Austin, Ernest, Hubert, Harry and William. In January 1916, The Military Service Bill became law, and conscription started to make up for the shortfall in voluntary recruits. There were weekly appeals against being conscripted, some for practical and some for conscientious reasons. Rural district tribunals, chaired by Major Edmund Freame, decided the merits of each case. Sometimes exemptions were temporary to allow businesses to find new staff, as there was some resistance to employing women even as shop staff. Other exemptions were conditional or absolute, and many conditional exemptions were made for farm workers. On the practical side, a Motcombe farmer was offered a substitute worker to replace his son, who had been called up. The farmer objected as soon as he was told by the substitute that he suffered from asthma, pleurisy, bronchitis and a weak heart. ‘How could he put a man like that on the top of a rick cutting hay?’ The tribunal agreed that it was nonsense for the military authorities to offer men in such condition for heavy farm work. In March, the town clerk objected to the mobilisation of a well-sinker who gave a skilled and essential service to the town with its well-known water supply problems. At the August rural military tribunal, the military representative, Mr Kaines, objected to able-bodied men being given exemptions to take up jobs clearing rubbish from the camps. He called it ‘a shirkers’ haven’, and it was agreed to send a strongly worded protest to the War Office. However Mr W Gibbs, of Blynfield, Motcombe, was given an exemption, as he had already served 14 years, including in the campaign at Gallipoli where he was awarded the DSM. He also had three brothers who were still serving. Some exemptions were refused, provided that the military authorities could supply an acceptable substitute. Conscientious objectors to military service also had to apply for exemption from service at local tribunals. Official guidance to the tribunals included tests of truthfulness, and the military authorities could appeal against the tribunals’ decisions. Once exempt from military service, conscientious objectors could be required by the Pelham Committee to undertake ‘work of national importance’, for example on farms, or in ‘controlled establishments’. However many employers did not want to use the objectors. After the war ended, conscientious objectors doing such work had to obtain a letter of consent from the Pelham Committee and their war employer before they were allowed to return to their former jobs. 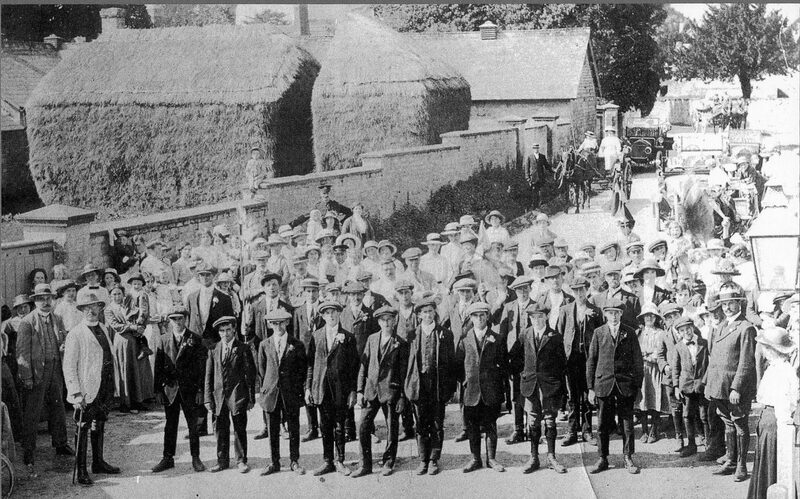 There were several conscientious objectors in Shaftesbury, many of them members of the Quaker community. One of them, Arthur Kingsley Rutter, obtained ‘exemption absolute’ in February 1916, but the military authorities applied for its withdrawal in December. Hearings resulted in him being required to leave his articled solicitor’s clerkship and obtain ‘work of national importance’. He eventually obtained work on a farm/market garden near Bristol from March 1917 until February 1919, when he returned to his articled clerkship in Shaftesbury. In July Marnhull lost its district nurse, Nurse Townsend, as she took up an appointment with the military authorities. In the same month, Private Weldon was arrested in Shaftesbury for being absent without leave. He had left camp because his father had just died. He was apprehended in Shaftesbury but allowed to attend the funeral and was then escorted back to camp. Not all reports received from the Front were accurate. Mr and Mrs Harris of Guest Farm, Motcombe, had been told their son, Private Ivor Harris, serving with the First Canadian Contingent, had died, but found out later that he was alive in hospital, recovering from shrapnel wounds. Their other son, Arthur, also serving with the Canadians, although wounded, had also survived and had returned to Canada. In April, new army orders were issued concerning soldiers’ rations in billets. Meat. 4oz. 12 oz. ………..
Breakfast meat was to be bacon, served with a pint of tea with milk and sugar. Dinner had to include 8oz of potatoes or other vegetables, and supper a pint of tea and 3oz of cheese. In September, the Rector of Shaftesbury, the Reverend Charles Rockett, left his parish to take up work amongst the troops in France, in connection with the Church Army. The recruitment drive continued: in October motor drivers were required, as were men, skilled or unskilled for the Royal Flying Corps. Schools were encouraged to increase cadet corps numbers to be affiliated to Volunteer detachments. When the boys reached the age of 17 it was expected that they would transfer to the Volunteers. Shaftesbury, Wimborne and Weymouth secondary schools all had Cadet Corps and there were also 15 detachments of the 2nd Salisbury Cadet Battalion Church Lads Brigade. At the very end of the war, tragedy struck the Alner family of 14, Gold Hill, Shaftesbury. They lost two sons, Private Harry (Walter) Alner who was killed in action in France on October 31st, and Private Sidney Alner aged 19 who died of pneumonia on November 19th at Aldershot after being wounded in France. Sidney’s funeral took place at Holy Trinity Church, where he had been a choirboy. He had worked for Stratton, Sons and Mead, and appears on their Roll of Honour. The death of another soldier, Private E.G. Kendall, was reported in November. He died of pneumonia following a chill at Fovant Camp. He is buried at East Stour Church. Other deaths from pneumonia were reported at this time, including those of Sergeant Sydney Hubbard of Iwerne Minster, in France on November 20th, and Private T. M. Scadden, manager of the Royal Oak in Motcombe. Private Scadden, aged 38, had only joined up ten weeks previously, and was well-known and highly respected in the district. In November the Western Gazette reported the award to Lance-Corporal H. Vose, of the Military Medal for conspicuous gallantry and devotion to duty, for leading his men through a heavy machine-gun barrage near Langemarck, Belgium. He lived in Marnhull, and while on leave in July had married a local girl, Miss Brown. In December, prisoners of war started returning home, including Private Fred Coffin of Iwerne Minster who received an enthusiastic welcome.